Strong second half propels UCSD to victory in front of jam-packed RIMAC Arena on Friday night, and Tritons dominate following day. Despite having its six-game win streak snapped last week, the UCSD men’s basketball team returned to the court this past Friday and Saturday without any sign of a setback, securing two home victories against Cal State East Bay (2–12) and Cal State Monterey Bay (1–13). In front of a near-4,000 strong RIMAC Arena crowd in Friday’s annual Spirit Night game, the Tritons were able to overcome their early shooting woes to run away with a 65–54 win against Cal State East Bay. Both teams struggled shooting early on. The Tritons converted on only three of 16 from three point land in the first half. East Bay put up similar numbers, shooting only 35 percent from the field on 5–12 from deep. However, it was UCSD who held a slight 22–21 edge going into intermission. The Tritons wasted no time in the second half to make up for their earlier subpar shooting. The team’s combination of defense and three-point baskets gave them a 16-point cushion with six minutes remaining in the game. UCSD shot significantly better in the second half, making 44 percent of its threes, while holding East Bay to only 9–26 from the field. “We were a little more aggressive [in the second half],” Olen said. “We got a lot of the same looks. We felt like if we continued to get the same shots we did in the first half that we would certainly score enough points and that was the case.”Sophomore guard Adam Klie notched his first double-double as a Triton, scoring 12 points — nine of which came in the second period — and bringing down a career-best 11 rebounds. Junior forward Hunter Walker finished with a game-high 17 points and also added four rebounds and a pair of assists to his statline. It was Walker’s second straight game with 17 points and he now leads the team in scoring, averaging 12.6 points per game. UCSD continued its hot shooting the following night, coasting by Cal State Monterey Bay in an 84–61 victory. The home team started the first seven minutes of the game on a 10–0 run. The Tritons never trailed in the entire game, outscoring the Otters 43–21 in a dominant first half. Sophomore guard Jeff Van Dyke seemed to have found his stroke from the three point line, as the Carlsbad native scored all of his 15 points from deep. Klie continued to perform on the offensive end. The reigning California Collegiate Athletics Association Freshman of the Year finished the game with 17 points on 72 percent shooting from the field. Again, the team’s ability to convert turnovers into three pointers was incredibly effective throughout the entire game. UCSD had eight steals and forced 11 Otter turnovers while only losing the ball themselves five times. At one point, the lead grew to as large as 30 in the second half. With the two wins, the Tritons have won eight out of their last 10 games and are now tied with Cal State Stanislaus for second in the CCAA standings. However, UCSD faces a tough schedule ahead as six of the final eight games will be played on the road. The Tritons play a pair of crucial conference road games later this week when they visit Chico State University (11–3) on Friday and Cal State Stanislaus (10–4) Saturday night. Triton women escape with a 64–60 win over Cal State East Bay on Spirit Night before dominating Cal State Monterey Bay 73–56 on Saturday. 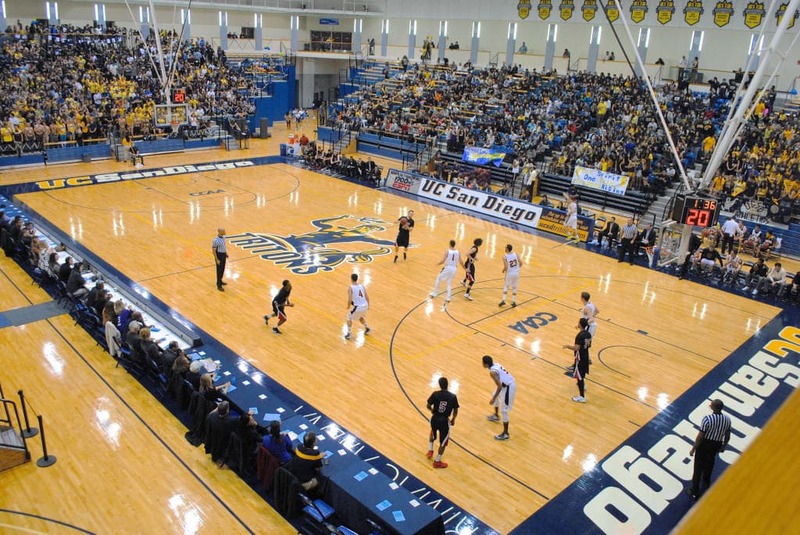 A staggering attendance for Spirit Night at RIMAC Arena this past Friday witnessed the UCSD women’s basketball team coming up on top 64–60 against fellow postseason contender Cal State East Bay (12–8 overall and 7–7 in the California Collegiate Athletics Association). The following night, the Tritons dominated from end to end and handed a 73–56 loss to Cal State Monterey Bay (4–15, 2–12 in CCAA standings). The Tritons now hold an 11–8 overall record and a 9–5 record in CCAA play, possessing the fifth spot in the conference. UCSD suffered a slow start on Friday evening and quickly trailed by seven after giving up two layups and a three pointer. The Tritons responded immediately, coming back to tie the score at 11 all with a little less than 10 minutes to play in the half. From then on, it was all Tritons for the rest of the half, as the home team outscored its opponent 26–10 and went into intermission holding a comfortable 40–23 advantage. However, the second frame was a reminder that no game is won halfway through. East Bay came back and cut the deficit to make it a single-digit game, 55–47 with a little more than four minutes and 39 seconds to play. The Pioneers continued to inch closer through the half; the Tritons were barely clinging to a 60–57 lead with 22 seconds left in the game. Junior guard Jamie Katuna then came up in the clutch, hitting the four free throws that would eventually secure the UCSD victory, despite East Bay’s efforts that cut the lead to 62–60 with only eight seconds remaining. It was a tale of two halves for the Tritons, who shot an impressive 57.1 percent (16–28) from the field in the first period but fell to 23.1 percent (6–26) from the floor in the second half. Hoever, Seto had a stellar night, finishing with 20 points on 55 percent (5–9) shooting while going 4–5 from three-point range. Junior forward Farrah Shokoor contributed with a team-best eight rebounds and also had 11 points. Katuna added 15 points off the bench in one of her best games of the season. The Tritons only picked up their pace Saturday, pummeling Cal State Monterey Bay 73–56 in another CCAA contest. UCSD started the game off well this time, jumping to an early 8–2 lead. However, the Tritons were not done, as three consecutive three-pointers gave them a dominant 24–6 advantage. Although the Otters cut the deficit to 12 points with nine minutes and 33 seconds remaining in the first half, UCSD still took an overwhelming 47–23 lead at the intermission after a senior forward McKennan Bertsch tip-in. After halftime, the lead went up to 25 points after another three-pointer from the Tritons. Monterey Bay could never close the gap to under 18 points and UCSD cruised to a second straight win. UCSD shot 50 percent (27–54) from the field and a terrific 50 percent (9–18) from downtown. In an impressive defensive effort, the Tritons held their opponents to just 36.4 percent (24–66) shooting from the field. Bertsch finished with a game-best 19 points. She is now leading the CCAA with 71.3 percent shooting over the season, with the next best far behind at 58 percent. Shokoor had nine points and five rebounds. The homestand is now over for the Tritons, who will go on the road next weekend and face two very winnable games against conference foes Chico State University (4–10) on Friday at 5:30 p.m. and Cal State Stanislaus (4–10) on Saturday, also at 5:30 p.m.